10 Best RC Cars Under $1000 [October 2017] #1 goes 0 to 60 in 2 sec ! Today we are taking a closer look at the creme de la crème of RC cars. We’re going to dwell deep into the RC cars under $1000 category. Of course, these RC models aren’t meant for beginners. I mean, that’s what their price strongly suggests. Sure, you can get one if you really want, but you will most likely not be able to get the most out of it. NOTE: These numbers will be slightly different from your Out Of The Box vehicles. 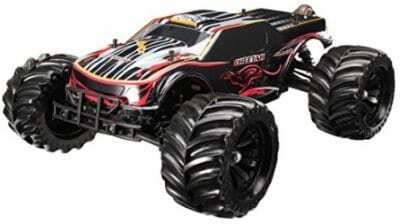 Which types of RC cars can be found in this list? But, if you are an experienced RC driver (or a collector of some sort), then you will agree with me that these 10 are the (some of the) best RC cars money can buy! And on this list, there is something for all of you! Whether you are racing on smooth tracks or you’re more of an off-road type of guy, you will find something that suits your needs. We’ve got different-sized models too. But, don’t expect anything under 1/10. Nope! I decided to concentrate solely on bigger, (pricier) and more powerful models. These are usually really fast and offer the best experience for people who know how to control them properly. 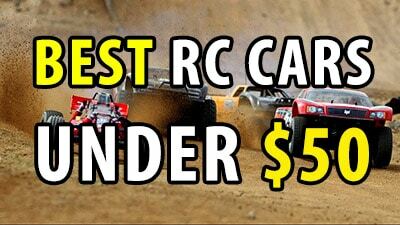 So, without any further adue, let’s start off and see what’s the best RC car under $1000! At 10th spot, we have Telluride Extreme Terrain made by Traxxas, a well-known brand. They specialize in other types of RC entertainment as well and are not bound solely to RC cars. But still, their RC car department is a massive hit. Why? Well, here’s what their “entry” level 1/10 model is all about! As expected, it works via 2.4GHz radio system which offers quite the operating range. Moving forward, it’s nice to know that all XL-5 electronics are properly sealed and that Telluride Extreme Terrain can brag with water resistance. This also allows it to drive on snow, puddles or during mild rain. But, that’s only one side of Traxxas Telluride. You see, besides all these capabilities, this speedy little devil is exceptional when it comes to its hardware. When it comes to the motor, you will be happy to know it runs on Titan 12-Turn 550 motor. Supporting it, Telluride has trail tuned differentials and grippy tires that do well on rocks. 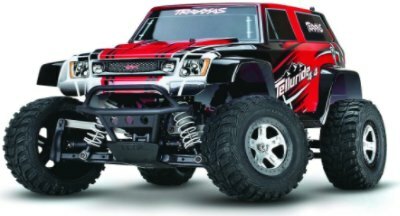 In addition to that, another noteworthy factor is its fiber composite construction which makes sure it won’t break apart during the first high-speed collision… and that makes Traxxas’ Telluride a beginner-friendly option. It’s 4WD of course, equipped with powder coated white springs that reduce impact and greatly increase flexibility. This is, I’m sure you already know, crucial for rocky terrains where suspensions are exposed to massive challenges. All in all, Traxxas Telluride Extreme Terrain is an excellent mid-level 1/10 model that can prepare you for fully-fledged RC racing! With a huge spoiler and extremely spikey wheels, the 2013 version of Egress looks to be set for class A RC racing! This 1/10 model is a real icon in the 4WD off-road racing industry and as such, it is widely respected. Why is that so? Let’s find out! For starters, it’s important to state that Egress 2013 incorporates all the high-tech mechanisms in modern day hobby market. That is what allows it to perform on par with the competition. Combined with its great appearance and durable design, there is nothing stopping this little fella. It runs with ball pressure plate differential and supports fully independent double wishbone suspension for increased flexibility on rough terrain. In addition to that, it is also important to note that it steers with a bell-crank mechanism. As I already mentioned above, it features spiked rubber wheels for extra grip. You do not have to worry about breaking this thing since its body is made out of polycarbonate and chassis out of carbon fiber plate. All things considered, if you want proven quality and great performance, Tamiya Egress 2013 should be the model to go for! Racing RC buggies are all the craze nowadays. That is not at all surprising considering the sheer abundance of models on the market. They are all, honestly, quite similar in terms of general appearance, with the only variations being in shells (graphics) and build quality. You don’t have to worry about the latter if you chose Kyosho EP Scorpion XXL VE since it is made out of only the highest quality materials. 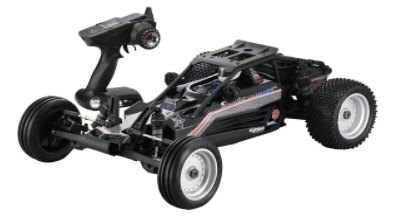 To top that, it also features 3mm main chassis with a molded perimeter frame for improved durability.So, if ruggedness is what you are looking for – look no further because this RC buggy can provide! With everything that’s already been stated, I’d say this one is a solid choice for people who are looking to mod their RCs as much as they can. Why? Well, it serves as a great platform for modding with lots of potential underneath the hood. When it comes to the interior, I’d like to clear out that Cheetah sports splashproof hardware. Don’t mistake it for waterproof though – those 2 terms aren’t the same! Furthermore, Cheetah’s metal shock absorber is also worth mentioning since it allows better controlling on various types of terrain. In terms of performance, JBL Racing Cheetah can boast with a powerful 3S LiPo battery running the show. More precisely, it sports a 4000mAh 30C LiPo, but you are encouraged to upgrade to a higher C model. ESC incorporates 80A which means you have plenty of headroom for improvement. Lastly, the main workforce of JBL Racing Cheetah is the 3670 2500kV motor. 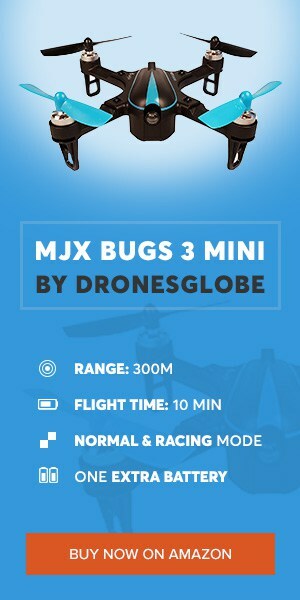 Not only is it waterproof but brushless too, allowing this speedy little devil to reach approximately 50 miles per hour. That’s around 80km/h for our European readers. if that’s not enough for you to buy this model, perhaps you should take a closer look at its price tag. For the lazy ones – it’s rather cheap so it’s definitely worth checking out! I’ll start this one off by stating that it’s a 1/10. Yes, Traxxas Slash might not be the biggest of the bunch, but it sure as hell has the performance to make up for it. Not only that but it is also gorgeous which is always a big plus to an RC car. Performance-wise, Traxxas Slash has nothing to be afraid about. With its brushless Velineon 3500 motor, this thing can easily achieve 40 mph and go a tad bit past that (60+ mph with a small upgrade). At these sorts of high speeds, one can never get enough of durability and protection. That is why Traxxas implemented a rigid triangulated chassis that is resistant to bending during collisions. Always a plus, right? When it comes to battery power, Traxxas Slash runs on a 7-cell NiMH battery by default. 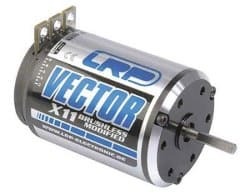 Of course, you can upgrade it to a 3s 11.1V LiPo which will give out whopping 60+ mph and a boost to operating duration. Stock battery dashes out around 15-20 minutes but with an upgraded one you are looking at well above 20 minutes. Feature-wise, Traxxas Slash has a whole bunch. TSM Stability Management, waterproof servo, Velineon VXL-3s speed control, 4WD, and sealed differentials are just the tip of the iceberg. Really, if you want a customizable, feature-rich RC car with a great potential, then Traxxas Slash seems like an excellent choice. Starting off with the hardware, we have the brushless 980KV motor working on a single speed transmission system. While that might drive away a huge portion of potential buyers, there are still few of those who prefer it that way. To make things better. Rampage XB-E features 2 3600mAH LiPo 11.1v batteries along with their respective charger. They can power this bad boy up for about 8 minutes which is why I suggest upgrading to 2 6s 6000mAh LiPo batteries which will get the duration up to 20 and allow Rampage to go even faster. Antother great thing about this one is its 150A electronic speed controller. 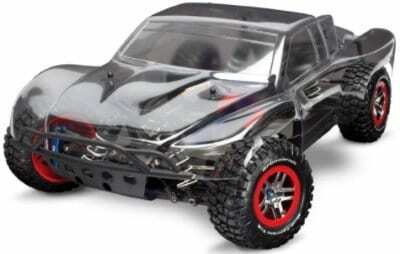 Likewise, Redcat Racing Rampage XB-E incorporates metal gears and a rigid 4mm aluminum T6 chassis. It is incredibly durable and will survive races even on toughest terrains. All in all, if off-road madness is what you are up for, then Rampage XB-E is all yours! This next RC car is rather special. It’s made by Traxxas and, with its exceptional performance, has already captivated a lot of its users! What is so special about it? Well, that is what I plan on showing you in the next couple of paragraphs below! The first good thing about this one is the fact that it comes in the RTR mode which means it is good to go straight out of the box. No assembly or any additional parts needed. Moving forward, probably the biggest selling point of this one is definitely its nitro powered engine. It runs on fuel rather than batteries and can achieve amazing top speeds of up to 45mph. 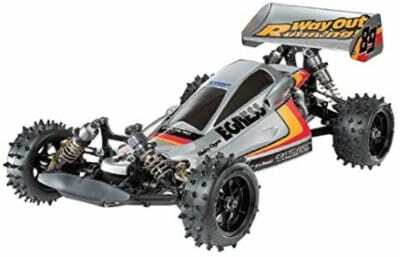 If that’s not enough to sell you Traxxas Revo 3.3, then its TQI 2.4 GHz radio that incorporates a ton of extra features. Feature-wise, Traxxas Revo 3.3 comes with the EZ Start electrical system, 150cc fuel tank, 6.3-inch tall tires with 17mm hubs. Additional accessories that come with this one are as follows – small fuel bottle with a sleek aluminum neck, extra air filter element, waterproof servo and everything else you need for a proper torque. 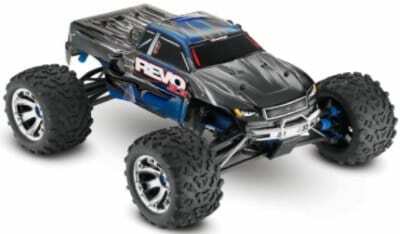 All in all, if you consider yourself an RC enthusiast, then Traxxas Revo 3.3 should really be in your lineup! There aren’t many better RC cars than this one, that’s for sure! The third spot on my list goes to yet another buggy (don’t worry, a fully fledged racing RC is coming right up at number two spot) with awesome hardware. But, it would not be on the third spot if it just had good hardware. No! This buggy is way more than that! Let’s take a closer look to understand it better! Starting off, we are talking about an RTR 1/8 model which has excellent independent suspensions, aluminum shock towers and durable chassis. All this makes it an excellent choice for off road fun and I’m pretty sure that’s what it is going to be used for in the first place. Moving forward, Serpent Electric 811 Cobra has 4WD and 3 gear differentials, making it extremely speedy and providing it with great torque. Needless to say, this thing accelerates like crazy! Additionally, it also sports 16mm bigbore shocks, sideguards along with a huge spoiler in the back. Lastly, I’d like to mention that it comes with DragonRC 2.4Ghz radio which is easy to use and makes up for an amazing package. So, if you are ready for an off road racing league and all you need is a proper RC buggy, look no further because Serpent Electric 811 Cobra is quite the steal considering its price tag. And finally, we have the first road racing RC car on display here. 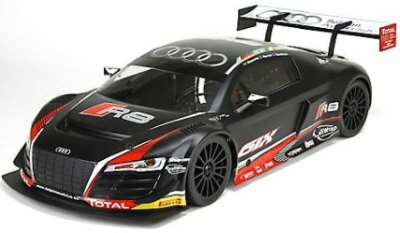 This gigantic 1/6 replica of Audi R8 is brushed to the smallest details. One thing is for sure though – it delivers an awesome aesthetic appearance. But of course, that’s not all this beauty is capable of! With its extremely powerful Dynamite 1200Kv brushless motor and up to 6S speed control, this thing is quite a beast. It also features EC5 connectors and can pull out amazing 60mph. Chassis is made out of aluminum and it even features molded grill, mirrors, canards and that cool looking spoiler in the back. When it comes to rest of its hardware, Team Losi did not fail to deliver. By implementing 18mm bore shocks, DX2E transmitter, and 2 2S (can be upgraded to 4s) LiPo batteries, I am sure you will agree with me that this RC car is a proper monster. Of course, running at such high speeds requires amazing handling. That’s where Spektrum AVC (Active Vehicle Control) comes into play. It provides you with an extra amount of directional stability as well as throttle control, giving you all the power you need with controlling this monster at the highest speeds possible. 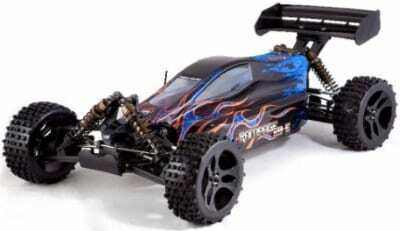 If speed is all you are looking for then this supercar is the RC car you should be investing your money in. It is ridiculously fast and with some proper upgrades, this thing can go over 100mph. Crazy, am I right? Let’s see what’s this supercar all about! Well, such a huge speed is no wonder since it rocks an amazingly powerful Traxxas Big Block electric model that goes from 0 to 60 in just above 2 seconds. 0 to 100 – less than 5. How amazing is that? But, in order to achieve these sorts of speeds, you will need to upgrade the stock batteries to 6S LiPo ones. That will provide the motor with an extra bit of power which it will gladly use. In order to stay in once piece with such huge speeds, Traxxas XO-1 has a class A build quality, unlike any other RC car you’ve seen. With reinforced steel gear differentials, aluminum driveshaft, steel-spline axles and 17mm hex hubs, this speed devil is all set for breaking records! It also comes with an elastomer damper that is placed between spur gear and its drive hub. The entire design was built with airflow and aerodynamics in mind. That is why it’s not surprising to see such a powerful downforce with XO-1 that minimizes drag which results in unsurpassed speeds going over 100mph with ease. Nitro vs Electric motors? Which is better? 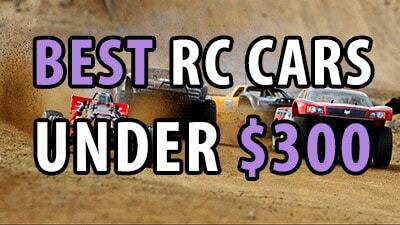 If you are willing to dash out a good chunk of money for your best RC car under $1000, you will be up against a particularly difficult decision – going for an electric or nitro-powered motor? Believe me, you are not the first person that’s going through this crisis – we’ve all been there… Well, at least I did and I am willing to share my knowledge with you guys! 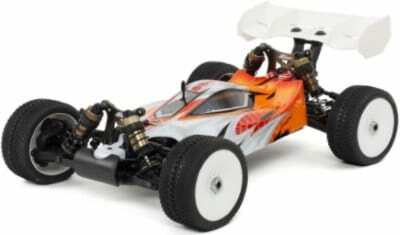 Many people swear that nitro engines in RC cars make them a lot faster than electric ones. While that might be true if we compare a nitro-powered and brushed electric RC cars, that wouldn’t be the case with brushless ones. On the contrary actually, brushless electric motors (in combination with a proper, high C rated LiPo) are much faster than nitro powered ones. Plus, they work on batteries meaning you don’t have to go out and buy nitro fuel after every racing session. However, Nitro-powered RC cars are (at least in my personal experience) a lot more fun than their electric counterparts. Among other things, that’s also due to their thrilling (and very loud) sound which sweeps the floor with electrics. 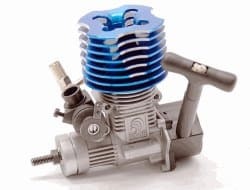 On the downside – nitro engines require a lot of tuning, cleaning and general maintenance so they’re not exactly meant for beginners. Also, their entire pre-racing setup process is time-consuming. Some people like it, some people don’t… It’s up for you to decide! Brushless cars are enjoying a huge amount of popularity for quite some time now. Their prices have dropped significantly over the last few years which makes them more affordable than ever. Plus, LiPo battery prices are also dropping which is a win-win situation for all electric racers. But how do they perform against nitro-powered ones? As I’ve already stated above, electric motors are (in most cases) faster than nitro-powered ones. However, they don’t offer that unique driving experience that comes with loud nitro engine sounds. Electric motors require little to no maintenance and will last longer than nitro ones… except if forced too drastically. In terms of price, all they require is an upfront investment in a supported battery and charger and that’s it… while on the other hand nitro engines require fuel (who would’ve guessed, eh?) in order to race. 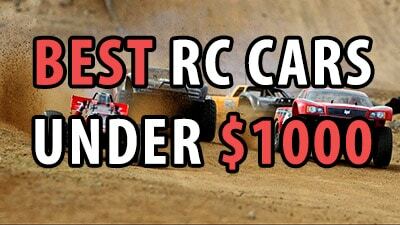 So with that last Traxxas model (there was a total of 4 of them on this list of RC cars under $1000, just realized that haha), I’m afraid we have come to the end. It’s been quite the road from the very top. Hopefully, you’ve noticed that there’s a mild curve approaching the number 1 spot. That’s because I really did my best to provide you with a 100% objective lineup. With that being said, if you’re thinking of buying a drone, I hope this list helped you with your decision. It’s a big investment, no doubt about it. But, that just one more reason to do a good research so you don’t end up disappointed.